Adventures in Alveyland: Welcome home Joshua Tucker! On January 25, we brought home Joshua Tucker. 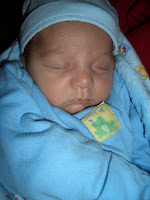 Joshua was born on Friday, December 22, 2006 and weighed in at 5 lbs., and 15 oz. God has blessed us with a son! Wow. He is doing well; eating, sleeping and pooping. We have a long way to go on the road to adoption, but I believe God brought Joshua to us and so will take care of all of the details. Here are some photos of our beautiful boy! Wow, a new baby boy! I can't wait to see him hit a ball. Congratulations!! What a beautiful family.